Remotes Car Keys should be your first call! At Remotes Car Keys (A Div of A-1 Locksmith) Ignition Repair Grand Rapids MI, is done with you in mind. If your key will no longer turn in the ignition or simply won't go in at all, rebuild rather than replace. Why?, See Pictures Below! 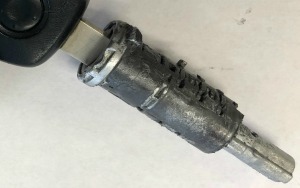 Rebuilding your ignition will help you avoid having to replace your key or keys. We will replace the tiny parts of the ignition that are causing your key to become hung up. Then, it will turn & start smoothly again. And, If you catch it before it totally goes out, you can drive it to us. WARNING: If you wait until it stops working altogether, we will need to come to you! (Or, you can use insurance to tow the car to us and save us coming to you -- will cost less. 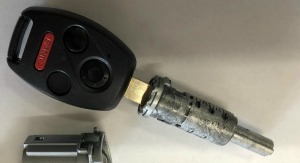 Also, If your ignition is replaced, you'll then be forced to use two different keys (the new one-to start the car & the old one to lock/unlock the doors). Inconvenient. If you have considered taking the car to the dealer -- keep in mind that you can save up to 1/2 off by using us. Most common vehicles that we rebuild are GM, Chrysler, Dodge, Jeep, Ford, Lincoln, Mercury & Honda ignitions. Ignition repair Grand Rapids MI by Remotes Car Keys, A Div. of A-1 Locksmith Service LLC. Ignition for 2010 Honda Civic. Customer had to force key into ignition and it would not turn to start the car. Pic on left, shows the wafers all sticking out here and there (that's the problem). Once those wafers were replaced (pic on right) the ignition worked and started just like new!